Fish, soooo yummy, soooo versatile and soooo good for you! An excellent low fat source of protein, vitamins and minerals, fish is also packed full of omega 3 fatty acids which can help prevent heart disease and also reduces your chances of a stroke or heart attack. 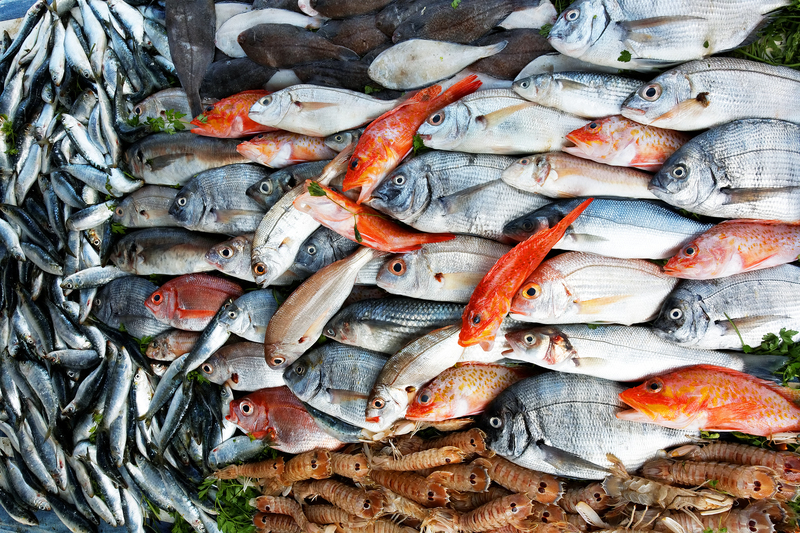 Yet despite the numerous health benefits people are still not getting enough fish in their diet – the American Heart Foundation actually recommends people eat 2-3 fish meals per week. For many I think the idea of cooking fish is rather daunting and there mere thought of having a raw plain white piece of fish sat in front of them sends them running for the hills or that nearest piece of meat! It has a bit of a reputation as being bland or difficult to cook when in fact it is so easy and quick to cook! So, by popular request, here are my top 5 EASY Fish recipes. I can’t promise you that they are gourmet meals BUT they are cost-effective and simple and tasty enough to bung in the oven on your average week night, when you are likely to be short on time and energy! Coat two Barramundi fillets in a generous amount of ground cumin along with a little salt and pepper. Put a small amount of cold pressed olive oil in a frying pan and slowly fry on a medium heat, approx 5-6 mins each side. You will know when it is cooked if you cut into it gently and the flesh comes apart easily. Make a dressing from 1 cup natural yogurt, 2 tablespoons cold pressed olive oil, a good squeeze of fresh lemon juice and a little salt and pepper. Serve with your choice of green vegetables… we think english spinach works really well. Pre heat the oven to 200c. Place the trout in a piece of tin foil with a little salt and some pepper. Drizzle on a little Balsamic vinegar, cover the top with chopped sun-dried tomatoes and fresh basil and finally sprinkle on a few squares of feta cheese. Wrap the foil up into a parcel and place in the oven for around 20 mins or until the fish is cooked all the way through. Serve with some steamed broccoli. Pre heat the oven to around 200c. Place fish on some tin foil with a little salt and pepper. In a jug mix together 2 tablespoons of sesame oil, a little olive oil, a good amount of chopped fresh ginger, a small chopped onion, 1 tablespoon of organic tamari sauce. Mix together and pour over the fish. Wrap the foil up to form a parcel then ideally leave to marinate for about 30 mins (you don’t have to marinate but it is better if you do) Then bake the parcel in the oven for about 20 mins or until the fish is cooked through. Serve on a bed of steamed bok choy. Pre heat the oven to around 200c. Place fish on some tin foil with a little salt and pepper. In a jug mix together the juice of half to one lemon and a clove or two of garlic (depending on how much lemon and garlic you like, taste to see) Add a red chilli and plenty of fresh coriander. Mix together and pour over the fish, wrap the foil up into a parcel. Place the parcel in the oven for about 20 mins until the fish is cooked through. Julienne a courgette (zucchini) into long thin strips lengthwise and blanch for one minute in hot water. It has the consistency of spaghetti but no where near as many cals! Combine 400g of chopped raw salmon, 2 tablespoons of chopped parsley, zest from 1 lemon, a little salt and pepper and one egg white into a food processor. Pulse until combined then remove and shape into 4 burgers. Coat in almond meal and rest in the fridge for 15 mins to help them set. Cook in a pan over a low to medium heat with a little olive oil until crisp, golden and cooked through. Serve over lots of leafy greens and then drizzle over 2 tablespoons of lemon juice, 4 tablespoons of olive oil and a pinch of black pepper. I feel hungry just reading this – yum! Thanks for your comment! Enjoy… the Barramundi with Cumin is my fav! Just made the Cumin Barra and it was 1) such a simple dish to make, genuinely took 10 mins. 2) amazing, so much so that as I fortunately made too much of the dressing we’re having it again tomorrow. Keep them coming Tess. Hi guys! Thank you so much for your comments and feedback, I really appreciate it! Am so glad that you enjoyed the Cumin Barra recipe as much as we do! No worries, lots more waiting in the wings… new post to follow soon! Have a great day! Just had the Spicy Snapper and absolutely loved it… And that is coming from someone who is not normally a fish fan! Fantastic, healthy recipe! Thank you. I have a new favourite Fish Dish! Did not think it was possible after the spicy snapper and cumin baramundi… LOVE, LOVE, LOVE the Asian John Dory with Pak choi! Thank you for these posts! Awesome! So glad you enjoyed it! I have a few more fish recipes on the boil at the moment so watch this space!